A well-traveled guest conductor, Emmanuel Villaume was music director of the Spoleto Festival USA for ten years. He’ll be only the third music director in Dallas Opera history. For only its third music director in its 56-year-history, the Dallas Opera has appointed the well-regarded and well-traveled Emmanuel Villaume, who was the director of the Spoleto Festival USA from 2001 to 2010. He replaces Graeme Jenkins, who stepped down after 20 seasons with the last performance of The Aspern Papers April 28. Much of Villaume’s career, before and after Spoleto, has been spent racking up international credits as a guest conductor. He has performed with the Metropolitan Opera, Deutsche Oper Berlin, Teatro la fenice in Venice, Los Angeles Opera and Royal Opera House, Covent Garden. He has also recorded with Placido Domingo and Anna Netrebko and is the artistic director of the National Slovenian Philharmonic Orchestra as well as Chief Conductor of the National Slovak Philharmonic Orchestra in Bratislava. At a morning press conference in the Dallas Opera’s boardroom at the Winspear, Villaume said he was looking forward to having a creative home, after years spent going from “suitcase to suitcase.” The Dallas Opera’s contract specifies that Villaume will conduct at least two operas per season, although Villaume will conduct only one next season, opening the season with Carmen in October. His online biography says he makes his home in Paris and New York, but he said he was hoping to have a residence in Dallas — because his duties as music director entail engaging the community. Born and raised in Strasbourg, which is right on the border between France and Germany, Villaume said that one of the privileges of being music director is that, at last, he gets to reserve for himself some of the big, choice operas — somewhat surprisingly, in his case, that means works from the German canon, which, other than Mozart or Strauss, the Dallas Opera has not done much. With permission from general director Keith Cerny, the new conductor hinted that for its 2014-’15 season, the Dallas Opera will present a Mozart opera (one with a Beaumarchais libretto, he joked — knowing that didn’t narrow things down much) as well as a rarely performed Russian opera. 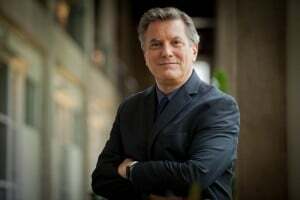 DALLAS, APRIL 30, 2013 – The Dallas Opera is thrilled to announce the appointment of a distinguished new music director—only the third person ever to be named to that position in the 56-year history of the company. The official announcement was made by Dallas Opera General Director and CEO Keith Cerny at a morning media event, as he introduced critically acclaimed French-born conductor Emmanuel Villaume. Maestro Emmanuel Villaume has appeared in the world’s most important and prestigious opera houses. These include engagements with the Metropolitan Opera (Madama Butterfly, Samson et Dalila, and Carmen); Royal Opera House, Covent Garden (Les contes d’Hoffmann and La rondine); Lyric Opera of Chicago (Samson et Dalila, Manon, and The Merry Widow); Washington’s National Opera (Werther, La rondine, Norma, Le Cid, Les contes d’Hoffmann and Lucia di Lammermoor); San Francisco Opera (Madama Butterfly and Werther); Los Angeles Opera (La rondine and La Grande-Duchesse de Gérolstein); Santa Fe Opera (Les pêcheurs du perles and Carmen); Opéra de Paris (Rigoletto); Teatro la fenice in Venice (Thaïs and Il crociato); Deutsche Oper Berlin (Tosca); Madrid’s Teatro Real (Les contes d’Hoffmann and Werther); and Debussey’s Pelléas et Mélisande at Teatro Colón in Buenos Aires, Argentina. After opening Dallas Opera’s 2013-2014 Season (“By Love Transformed”), Maestro Villaume returns to Royal Opera House, Covent Garden for performances of Massenet’s Manon and to Venice’s La fenice for performances of L’africaine. Maestro Villaume maintains a busy schedule of symphonic performances including concerts with the Slovak Philharmonic Orchestra and the Slovenian Philharmonic. Recent and upcoming highlights of Maestro Villaume’s 2012-2013 operatic season include performances of La bohème with Lyric Opera of Chicago; appearances on the podium of Munich’s Bavarian State Opera in Les contes d’Hoffmann; and a return to Santa Fe Opera in La Grande-Duchesse de Gérolstein, starring mezzo-soprano Susan Graham, who recently starred in the Dallas Opera’s 25th Anniversary production of Dominick Argento’s The Aspern Papers. In 2012, Maestro Villaume toured throughout Europe in concert performances of Tchaikovsky’s Iolanta, starring soprano Anna Netrebko, with performances in Berlin, Vienna, Amsterdam, Paris, and several other European capitals of music. He also led Washington National Opera in performances of Werther as well as last summer’s well-received Santa Fe Opera production of Georges Bizet’s Les pêcheurs de perles (“The Pearl Fishers”). Maestro Villaume remains in demand for symphonic engagements around the world, and he has appeared with the Danish National Orchestra, St. Petersburg Symphony, Spoleto Festival USA, the Royal Philharmonic Orchestra (Stockholm), and the Ruhrtriennale Festival in Northwest Germany. His schedule includes additional prestigious future engagements not yet announced to the public. “Maestro Villaume will work in a multi-faceted capacity during the production season, but our new Music Director will also spend time outside the regular season spreading the word about TDO throughout the Metroplex. Maestro Villaume has attracted the favorable notice of critics throughout his career. Maestro Villaume will officially be known as the Mrs. Eugene McDermott Music Director in Honor of Graeme Jenkins.